Microphones pick up sounds generated by performers of the art. 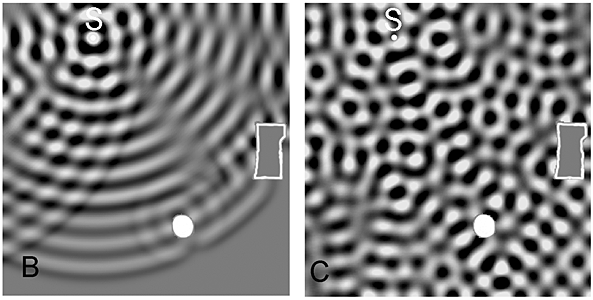 Microphones have 3D directional properties, with which they sample the sound field. The output signals from n-microphones are recorded and stored in analog or digital format on a storage medium. The recording engineer has set up or hung the microphones to optimally achieve his objectives within the given constraints. The recording engineer down-mixes the n-microphone signals to 2.0, 5.1 or 7.1 channels using an acoustically treated recording studio and his preferred monitor loudspeakers. Other speakers may also be used to hear how the recording translates. This process must be called 'rendering the art', because it is unlikely that a person would have heard the same sound live. The performance, the art, is rendered according to the desires of the recording engineer, conductor and producer. The outcome of this process is misleadingly called 'The Recording'. In addition to the musicians and performers of the art it carries the signature of the people who made the specific 'recording'. When the recording is played back in the home a listener is unlikely to hear a reproduction of what the mixing engineer heard in his studio with his monitors. He hears a rendering of the recording, which is defined largely by the on-axis response of his speakers and their illumination in 3D of his listening room and the room's acoustics. The recording studio acoustics are quite dead so that the direct sound from the speakers dominates what the recording engineer hears and uses for his mixing decisions. A home listening environment is much more live than a recording studio and it is difficult and costly to change it into the acoustics of a purpose-built studio. Besides it would not be a pleasant acoustic environment to live in other than for sound reproduction. Fortunately loudspeakers can be built such that our hearing will focus on the direct sound and withdraw attention from the room sound. Thus it becomes possible to hear what the recording engineer heard and even more, because conventional monitor loudspeakers have limitations. In its most accurate, but highly impractical form, a binaural recording captures the eardrum signals of a particular person at an acoustic event. The signals are then played back for the same person using headphones, which have been equalized so that the identical signal is reproduced at the eardrums as was present there during recording, Figure 1. The same small microphones (behind thin, flexible plastic tubes almost touching the eardrums) as used during recording, are also used to equalize the headphones for playback. It has been reported that on playback the aural scene is localized outside of the head, even when in frontal line of sight . If the head is turned sideways during recording, then the aural scene turns sideways during playback. But if the head is turned during playback, then the eardrum signals do not change and the position of the aural scene moves with the head, which is unnatural. This tends to collapse the aural scene to a location inside the head. In practice an artificial head is used, with outer ears of generic shape and texture. Neck, shoulders and upper body are included for scientific work' Figure 2. Microphones are usually mounted at the ear canal entrance. The microphone signal frequency response describes the Head-Related-Transfer-Function, HRTF, for blocked ear canals of this manniquin. It would seem natural that binaural recordings should work well for stereo loudspeaker sound reproduction. But the frequency response above about 3 kHz of the microphone pickup at the blocked ear canal is strongly determined by the shape and detail of the outer ear and the direction of sound incidence. This is the Interaural-Level-Difference, ILD frequency range of directional hearing. When this signal is reproduced over loudspeakers the response variations impart a coloration and misleading directional cues to the signals arriving from +/-300 at the listener's ears. Stereo recording microphones therefore have no pinna. The shape of the head and the distance between the ears causes sounds to arrive at the ears at slightly different times depending upon the direction of the sound source. Arrival times differ by less than 700 ms, which is used to give the brain directional cues in the Interaural-Time-Difference, ITD frequency range of hearing below 800 Hz. ITD and ILD are elements of the Head-Related-Transfer-Function, HRTF. 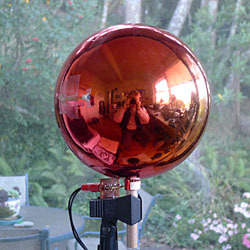 A sphere microphone preserves the spacing between the ears for low frequency sound localization and provides blockage of sound between the ears for the higher frequencies, Figure 3, . 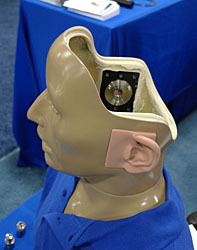 I have used this microphone and a similar setup for my own head, Figure 4, to make recordings of events where I also then had a direct memory of what I heard. This gave me material to evaluate my loudspeaker designs. Stereo over two loudspeakers works by creating a phantom acoustic scene between the loudspeakers. In its simplest form a single monaural signal is fed to both left and right loudspeakers. If the two loudspeaker levels are identical and there is no phase difference between them, then a listener on the center line between the loudspeakers will hear the monaural sound as coming from the center though there is no sound coming from that direction. This is basically a very unnatural event and so a slight movement to the left or right will shift the phantom source to the nearer loudspeaker. If the monaural signal is artificial, like pink noise, then there will also be a change in tonal color at certain off-center locations due to interference of left and right loudspeaker signals at the ears. This has been called "the fundamental flaw of 2-channel stereo" and a reason for promoting a center channel in 5.1 surround . But surround has its own phantom source issues, between L and C, between C and R and more. While the off-center interference is audible with pink noise, it is not an issue with signals that are known to the brain like music or voice and when there is a reverberant sound field due to the listening room. The timbre of sound from a center loudspeaker can be somewhat different from the timbre of the corresponding center phantom source, because sound arrives from different angles at the ears in the two cases. Thus their HRTF and the number of sound streams is different, but the brain compensates effectively. Primarily level panning is used for recording because it provides a more defined phantom source, Figure 5 and Figure 7. Today the majority of recordings are produced by down-mixing a multiplicity of monaural tracks of different instrument pick-ups into a 2-channel or n-channel format, Figure 6. 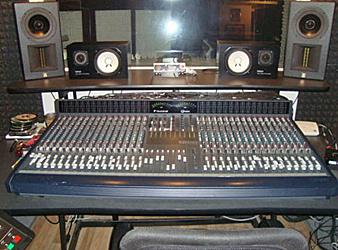 Today, the large mixing board is implemented in digital form on a computer with a large screen display. The mix-down often involves equalization, the addition of reverberation and compression in order to fit the taste of the recording engineer and market expectations as seen by the producer. Panning distributes phantom sources along a line between the loudspeakers. The distance of the phantom scene from a listener is essentially given by the distance between listener and loudspeaker. If the loudspeakers are highly directional and the room is acoustically dead, then the image is sometimes closer than the loudspeakers, approaching headphone listening. Depth and height behind the loudspeaker line depends upon cues that the brain receives from reverberation and volume levels of sources in the recording. It is difficult to produce a spatially coherent mix from multiple tracks that is believable. The result is typically a collage of phantom sound clusters next to and on top of each other, or a wash of diffuse sound. Fig. 8 Polar responses of Omni-directional, Wide-cardioid, Cardioid, Super-cardioid, Hyper-cardioid and Bi-directional microphones with identical outputs at 00 sound incidence angle. Output polarity is reversed with three of the microphone types for sound incidence from the rear. Fig. 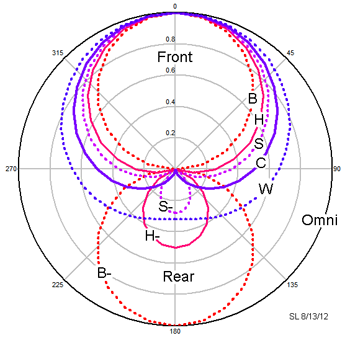 9 Polar responses of two cardioid microphones at +/-550 angle to each other in the horizontal plane and mounted on top of each other for coincident sound arrival at the microphones. A signal at 250 incidence, for example, produces a larger output level from the right microphones than from the left microphone. Microphones are built with a wide variety of directional characteristics. A few types are shown in Figure 8. The directional behavior is usually frequency dependent to some degree and more so with large diameter and large area microphones. An issue with directional microphones is decreased sensitivity to lower frequencies, high sensitivity to wind noise, pop and shock. Unlike omni-directional microphones, which are sealed sound pressure sensors, directional microphones result from a combination of omni- and bi-directional elements. The bi-directional element is sensitive to sound particle velocity and its direction. A coincident pair of directional microphones pointing in different directions will have have outputs that are in-phase but differ in amplitude when sound is incident at angles other than 00 or 1800, Figure 9. Fig. 10 The polar diagram of Figure 9 has been redrawn with a linear axis for the angle of sound incidence and the ratio of right to left outputs in dB has been added. 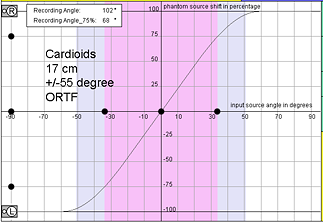 The ratio determines the position of a corresponding phantom source between the loudspeakers according to the panning law of Figure 7. For example, at 250 incidence we see that R/L = 4 dB. Using this value and 0 ms time difference between the channels in Figure 7, we find that the phantom source should be about 150 to the right of center or 50% towards the right loudspeaker at 300. The 10 dB level difference from a signal at 550 will produce a phantom source at about 250 or 83%. The 900 and 1350 signals map into the right loudspeaker. Any signal at 1800 will show up as a center phantom. 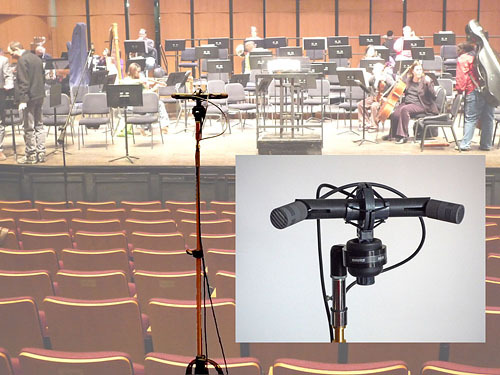 Any pair of angled, coincident, directional microphones will automatically pan the recorded acoustic scene onto the line between left and right loudspeakers as a phantom scene. It will pan into left and right loudspeakers as monaural signals those portions of the +/-1800 view, which do not translate into phantom sources, because the microphone output levels differ too much. The monaural signals are problematic because they set hard boundaries to the phantom scene, which usually is not in keeping with the spread of the aural scene. It draws attention to the loudspeakers and their location, rather than letting the loudspeakers disappear from perception with eyes closed. Fig. 11 Near-coincident pair of microphones. They are mounted at an angle to each other and to a stand with two shock mounts. Different types of directional microphones arranged as XY coincident, as near coincident or spaced pairs will lead to a different distribution of the recorded acoustic scene on a standard +/-300 loudspeaker setup for reproduction, Figure 11. 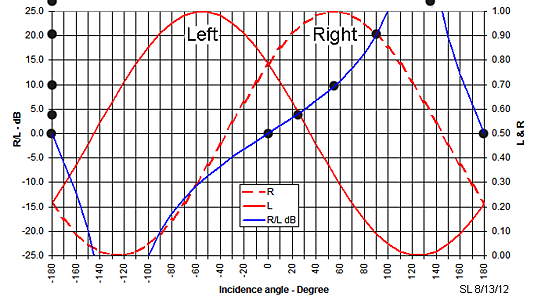 It is important to know the "Stereo Recording Angle" of a particular pair of microphones, because it determines which portion of the 3600 acoustic scene to be recorded will show up between the loudspeakers and with what linearity of distribution between the +/-75% points symmetrical to the center location. This has been calculated and catalogued with a JAVA applet following a panning law like in Figure 7, . 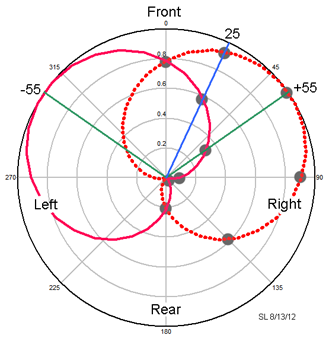 Results for a pair of cardioid microphones are shown in Figure 12. Fig. 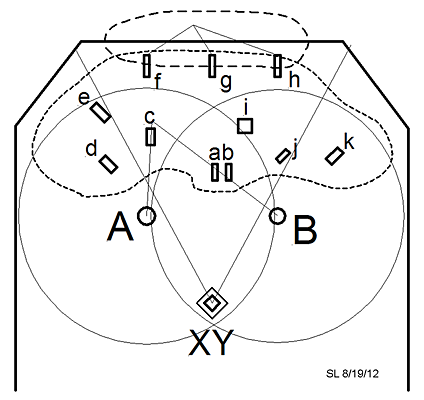 12 Stereo recording angle for three different arrangements of cardioid microphone pairs. The phantom positions for the +/-550 coincident pair must have been derived from a different panning relationship than in Figure 7. At 250 incidence the phantom source is at 30% or 90 off center whereas from Figure 10 and Figure 7 it would be at 50% and 150. It should be noted that panning relationships have been determined empirically. Different investigators report different results, also depending upon source material. Directional hearing is a brain process and subjective. Nevertheless the graphs can show trends. Widening the angle to +/-750 places a narrower +/-420 section of the acoustic scene between the 75% points, whereas before it were +/-590. Separating the microphones by 17 cm leads to the well know ORTF arrangement. It further narrows the 75% rendered angle to +/-340. The graphs only cover the +/-900 frontal plane, not +/-1800 and elevation. It also cannot be deduced from them how recorded and monaurally rendered left and right loudspeaker signals might affect spatial perception. What exactly then are the aural differences between the three arrangements in Figure 12? How does level panning, the sound of the same signal but at different levels from left and right loudspeakers, produce a phantom source between the loudspeakers? I call it a magic trick, because there is no sound-wave coming from the direction of the phantom source. The phantom source is a construct of the brain and based upon the signals at the eardrums. Below 1 kHz, where the wavelengths of sounds become large compared to the size of the human head, the ear signals differ very little in magnitude. But if the sound arrives from directions other than the vertical plane of head symmetry, then the ear signals contain a time difference. It is called interaural time difference or ITD and is a very strong contributor to directional hearing [8, 9]. 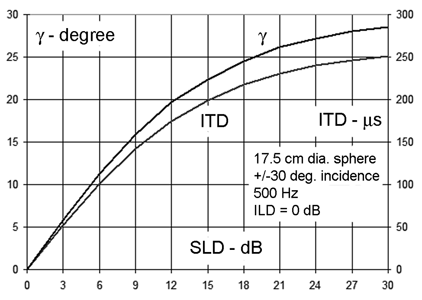 Interaural level differences, ILD predominate above above 3 kHz where the head and outer ear dimensions become large compared to the wavelengths of sounds. Fig. 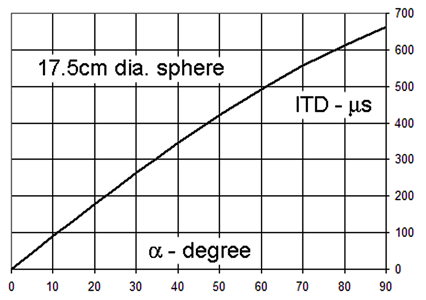 14 Interaural time difference as function of sound incidence angle a, where ITD = r/c (a + sin a) A sphere model of the head without sound diffraction allows for easy calculation of ITD versus sound incidence angle a, Figure 13. The maximum value of ITD becomes 263 ms for a stereo system with loudspeakers at +/-300, Figure 14. Each stereo loudspeaker sends its output to both left and right ears where they add as vectors, Figure 15. The phantom source direction, distance, size and sound are derived from the summed sound streams l and r. The frequency response for l and r shows that both ear signals have identical (!) magnitude, Figure 16a. Their level is maximum when L and R loudspeakers have the same output. The level decreases at both ears equally when one of the loudspeakers becomes louder and the other decreases while keeping L+R = constant . Fig. 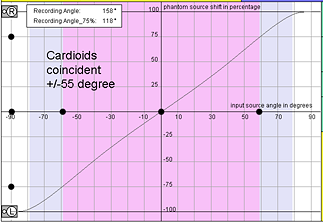 15 Loudspeaker signal summation at the ears, which leads to phantom source perception. Fig. 16 Frequency response of the summed ear signals. 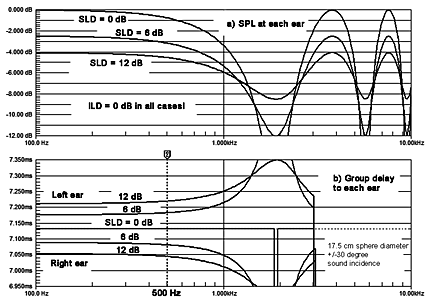 SPL at each ear (a) and group delay (b) as function of source level difference in dB. 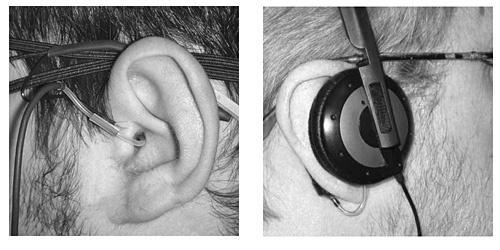 The ear signals differ in time of arrival, Figure 16b. ITD is directly related to SLD. Additional values have been calculated for a 500 Hz signal and are plotted in Figure 17 as a function of level differences between the loudspeakers. The ITD values are compared to those in Figure 14 for a real source. 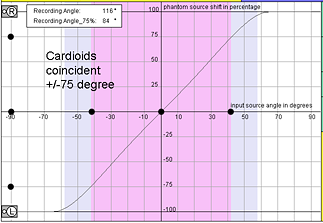 The comparison yields the phantom source angle g, which is thereby known as a function of SLD, . 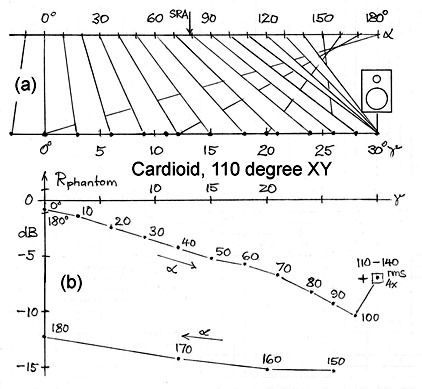 Knowing the output signals and their ratios for a coincident pair of cardioid microphones, Figure 10, we can now derive the phantom source angle g for a given source angle a and the relative sound level of the phantom source, Figure 18. Fig. 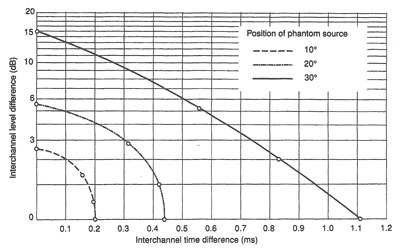 17 Interaural time difference and phantom source angle g as a function of level differences between two loudspeakers at +/-300. Fig. 18 Stereo rendering of a real source at angle a to a phantom source at angle g when level panned by a pair of coincident microphones at 1100 subtended angle. Transform of angle (a) and level (b) for a constant amplitude real source signal. The -7 dB monaural signal at g = 300 is the rms sum of source signals between 1100 and 1400. Linear addition of the four underlying signals would yield a level of -1 dB. If pure time panning is used, where left and right loudspeaker signals have the same magnitude and only differ in time, then the resulting ear signals have zero (!) time difference. The level at each ear changes in comb filter fashion with frequency and at a different rate for each ear depending upon the time difference. This produces a sense of spaciousness and maybe even a sense of phantom direction, but it is an unnatural phenomenon and peculiar to two loudspeaker stereo. Even near-coincident microphone recordings, as with an ORTF or a sphere microphone setup, would suffer from it to some extent in the ITD frequency range. Spaced microphone recording techniques are prone to large amounts of leakage between sound pickups. In the case of spaced omnis each microphone sees the whole acoustic scene from a different location. Each microphone output emphasizes different sound sources due to greater proximity to one or the other, Figure 19. 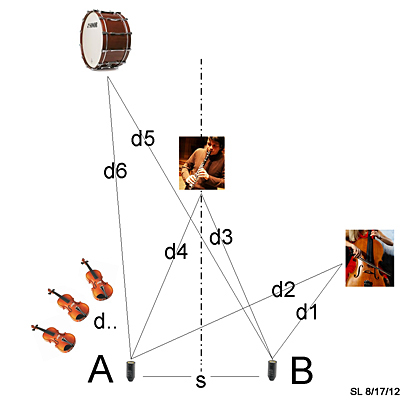 For example the cello is closer to microphone B than to A and its pickup will be [20*log(d2/d1)] dB stronger than from A. This ratio will also be modified by the frequency dependent directional radiation properties of the cello . Furthermore the path length difference [d2-d1] causes the output from microphone A to be delayed by [2.9*(d2-d1)] ms/m. The sound stream produced by the cello in the output of microphone B can therefore differ significantly in magnitude and phase from that in microphone A. Fig. 19 Two microphones with with separation s pick up different streams of sound from the same instruments. Fig. 20 The summed streams of microphone A are reproduced by the left loudspeaker and those of B by the right loudspeaker. Each ear receives a different sum of loudspeaker signals. 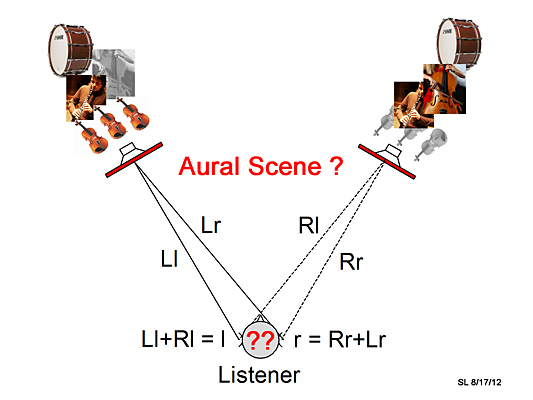 The aural scene between the loudspeakers is created in the brain of the listener from the two ear signals. The clarinet, which is at equal distance [d3=d4] from A and B will produce microphone outputs that still may differ in magnitude due to the directionality of clarinet sound radiation. The path lengths d5 and d6 do not differ much for the more distant drum, especially when compared to a wavelength, which is 3.4 m at 100 Hz. But since the drum is a dipolar radiator for many of its membrane vibration modes, it matters how it is facing A versus B. 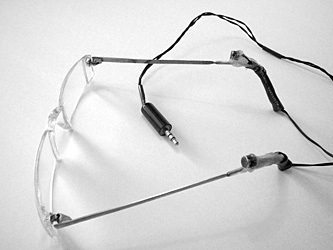 The strength and character of the sound pickup could vary depending upon the separation s between the microphones. The group of violins close to A will be distant in the microphone output B and of a different blend compared to their pickup from A. 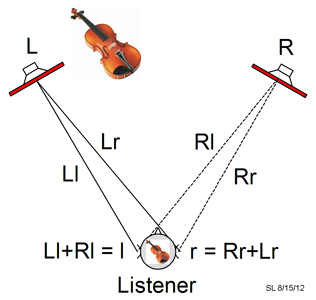 Instead of using A and B microphones in Figure 19 to produce a 2-channel recording a single microphone could have been assigned to the violins, the drum, clarinet and cello for a 4-channel recording. Unless these microphones are placed very close to their individual instruments they will pick up low levels of all the other instruments and the reverberant sound in the venue. But if a microphone is very too close to an instrument it might pick up a sound that is modified by the directional characteristics of the instrument, that is unnatural and would normally not be heard by an audience . All this can be avoided by placing each musician in an isolation booth and with headphones so he can hear everyone else to play in ensemble. Now we would have four sound tracks that can be level panned between left and right monitor loudspeakers to produce the 2-channel recording. Each track could even be panned multiple times. Violins, drum, clarinet and cello tracks have become sound objects that can be manipulated at will. The result is a collage of sound clusters that hang like sheets of laundry on a clothes line between the loudspeakers. Even when artificial reverberation is added to the mix the aural scene remains spatially flat and unnatural. It should be possible to use a single coincident XY microphone pair as the basis for rendering the spatial relationships between individual sound sources and their interaction with the reverberant sound field of the recording venue, Figure 21. The pair must be placed at some distance from the acoustic sources to minimize level differences between near and far instruments and to capture the width and height of the acoustic scene. Listening to stereo usually takes place in an enclosed space. 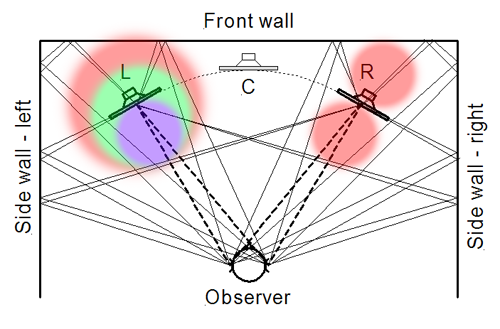 It means that the loudspeaker signal is reflected by walls and objects in the room not only once but again and again as it bounces around, Figure 22. The signal loses energy with each reflection. Very quickly the sound level in the room, away from the loudspeakers, becomes independent of listener location. That level is established by the rate at which acoustic power is fed into the room and the rate at which the reverberated sound is dissipated as heat by walls and objects. A listener very close to the loudspeakers will hear primarily the direct sound. At greater distance from the loudspeakers the reverberated and diffuse sound in the room dominates. It is louder than the direct sound at that location. The distance from the loudspeakers, at which direct and reverberant sound levels are equal, is called the reverberation radius or critical distance . Fig. 22 Wave tank display of a source S radiating a constant wavelength signal into a bounded surface. (B) Reflection of the initial wave by surrounding walls. Reflection and diffraction by objects. 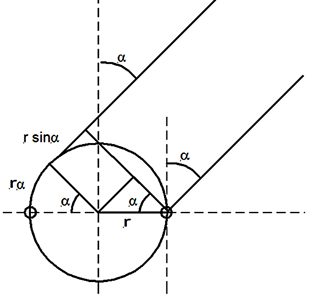 The circular object is in a plane wave or free-field situation for a short time. (C) Snapshot of the reverberating wave distribution at a later time. The circular object is immersed in a diffuse wave-field. At low frequencies, where the wavelength of sound is no longer small compared to the dimensions of the room, the reverberant field takes the form of standing waves or room modes. As a consequence, the difference in sound level between two locations in the room can be very large at certain low frequencies. Rendering problems can be minimized by installing acoustic absorbers and/or minimizing the excitation of objectionable modes by woofer placement and/or directivity. For example, the room in Figure 23 has 21 possible modes below 100 Hz. The degree to which anyone of these is stimulated depends upon loudspeaker placement and radiation pattern. In addition, which of these are heard depends upon the listener's location in the room. Mode frequencies are widely spaced at low frequencies. They become closer and eventually overlap as frequency increases. 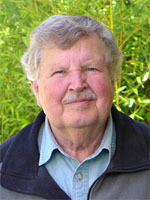 At the 120 Hz Schroeder frequency two mode frequencies fall within the 5.7 Hz resonance bandwidth of the modes. The reverberation time T60 is an important measure of a room's acoustic properties. It describes how fast the reverberant sound in the room decays by 60 dB when the loudspeaker is turned off. Knowing T60 one can calculate the Schroeder frequency, which is the low frequency boundary of statistical room behavior. One can also calculate the critical distance. A reverberation time of 384 ms means that 30% (41 m2 or 440 ft2) of the room surface area behaves acoustically like open windows through which sound escapes. That is more than the floor area in size. A shorter reverberation time requires even more absorption. The direct SPL from the loudspeaker, which decreases as [1/distance], becomes equal to the reverberant sound level at 0.89 m, provided that the loudspeaker radiates like a perfect omni. The critical radius becomes 1.55 m for an ideal dipole because of its directivity of 4.8 dB. Fig. 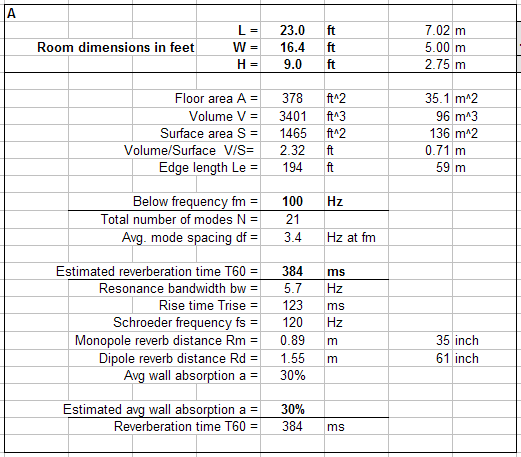 24 Reverberation time as function of room volume and surface area for different percentages of wall absorption. Fig. 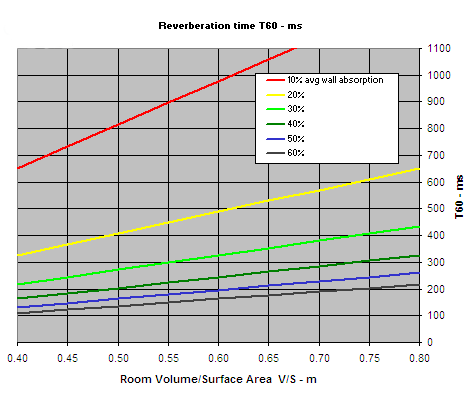 25 Reverberation radius as function of room volume for different reverberation times. If we wanted T60 = 250 ms for the above room, then the average wall absorption would have to increase to 54%, Figure 24. This will take considerable effort to achieve and the room will no longer be experienced as a normal living room. A reverberation time of 250 ms is required by EU Broadcasting Standards for recording studios. 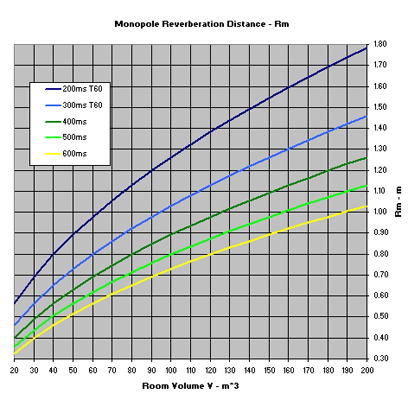 The benefit of reduced reverberation time is an increase in reverberation radius from 0.89 m to 1.30 m for the monopole and from 1.55 m to 2.25 m for the dipole, Figure 25. Typical studio monitors radiate omni-directional from low frequencies up to several hundredth of Hz. They become increasingly forward directional as frequency increases, when baffle and radiator sizes become first comparable and then large in size relative to the wavelengths of radiated sound. Thus the reverberation radius and the ratio of direct to reverberant sound will increase with frequency compared to the monitor's lower frequency interaction with the studio room. A dipole loudspeaker with frequency independent directivity will readily achieve the same direct-to-reverberant ratio in a more lively room as the typical monitor loudspeaker in a recording studio. Statistical room parameters can be estimated from the spreadsheet modes1.xls. The reflective and reverberant environment of a room restricts the placement and radiation characteristics of the loudspeakers. The equilateral triangle, formed by the loudspeakers and the listener in a stereo system setup, must be placed symmetrical to the room boundaries or large objects in the room, Figure 26. This ensures symmetry of the reflections relative to the center axis and a sharply defined center phantom image for monaural loudspeaker signals or center panned sounds. Each loudspeaker also must be placed at some distance from front and side walls so that reflections reach the ears later than the direct loudspeaker sounds. In that case the brain can filter out the direct sound streams more readily from those due to reflection and reverberation. A minimum time gap of 6 ms between direct and reflected sounds is needed, which translates to a minimum distance of 1 m from the walls. Fig. 26 Triangular loudspeaker and listener setup with symmetry relative to the walls and at some distance from them. The minimum distance is 1 m.
The left loudspeaker will generate spectrally incoherent sound streams at the observer's ears. Fig. 27 SPL in a room as function of distance from the loudspeaker. 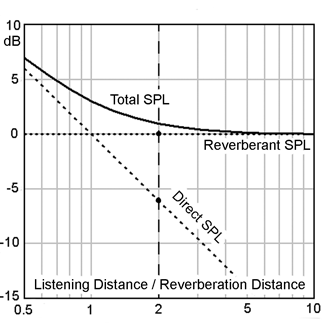 The listening distance should be less than twice the reverberation radius for D/R less than -6 dB. Furthermore, reflected sounds should be spectrally coherent with the direct sound to a high degree for unambiguous perceptual processing. Direct and reflected sounds then generate a reverberant sound field that is spectrally coherent with the direct sound at the listener's ears [14, 15, 16]. Under those conditions a listener can withdraw attention from the room and focus on the aural scene in front of him. Room and loudspeakers disappear. The type and performance of loudspeakers used, their setup, the listening distance and the room's acoustic properties determine the quality of the rendered aural scene at the consumer's end of the acoustical chain. The aural scene is ultimately limited by the recording. The type and configuration of microphones used, their setup, the venue, the monitor loudspeakers for the mix, their setup, the listening distance, the studio's acoustic properties and the mix determine the quality of the recording at the producer's end of the acoustical chain between performer and consumer. Monitor and consumer loudspeakers must exhibit close to constant directivity at all frequencies in order to obtain optimal results for recording and rendering.